Livones.net - A new Livonian poetry collection by Valts Ernštreits is published in the U.K. 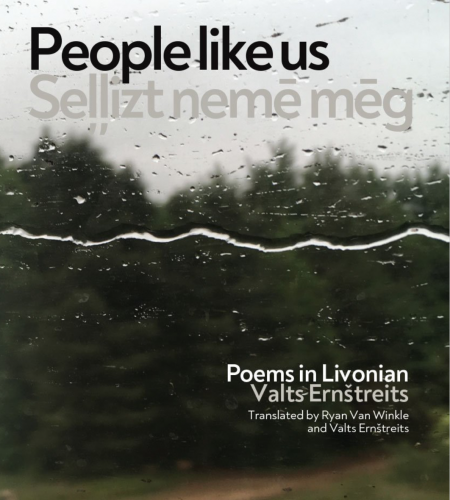 The UK publishing house “Francis Boutle Publishers” has released a new poetry collection “Seļļizt nemē mēg/People like us” by Livonian poet Valts Ernštreits. This bilingual (Livonian and English) collection contains poems in Livonian, which were written during different periods, though mostly during the course of the last year. This book takes the reader on a journey to the Livonian Coast, but also to now vanished parts of the Livonian world as well as places and lands found only in the Livonian imagination, which have not yet come into being. Though Valts Ernštreits has already published two poetry collections in Latvian – “Inter/rational” (2004) and “Dark Energy” (2014) – this is his first collection in Livonian. Also, it is noteworthy that this collection was published in London, which is where the first books ever published in Livonian appeared in 1863. This is not the first time that Valts Ernštreits’s work travels along an unusual path. In 2011, his monograph “Lībiešu rakstu valoda” (The Livonian Written Language) appeared in Latvia, but was actually translated from its original Estonian version by Livonian ethnologist Renāte Blumberga. Though Valts Ernštreits is credited in “Seļļizt nemē mēg/People like us” as the creator of its cover as well as one of its translators, the English-language versions of these poems are the work of American poet and translator Ryan van Winkle who resides in Scotland. Last fall, Van Winkle spent nearly an entire month in Latvia – in Rīga, Ventspils, and on the Livonian Coast – intensively working with the author on these translations. Livonian is a language indigenous to Latvia and in the present day slightly more than 20 people are able to freely converse in it. Among this group of speakers there are three poets – Valts Ernštreits, Baiba Damberga, and Ķempi Kārl. This means that while Livonian – in terms of publications – may have one of Europe’s smallest literatures, it also is in fact one of the largest in terms of the number of poets found among its speakers. The Livonian-English poetry collection “Trillium” published by these three poets in 2018 was the inspiration behind the creation of Ernštreits’s newly published bilingual poetry collection. Valts Ernštreits is a writer of Livonian descent who is deeply involved in work relating to Livonian culture and Livonian language maintenance, and is the author of many publications devoted to Livonian topics. Currently, Valts Ernštreits is the director of the University of Latvia Livonian Institute, which was established in Fall 2018. The creation and publication of this collection was supported by the Latvian State Culture Capital Foundation and the “Latvian Literature” platform.